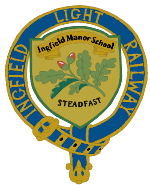 Due to unforeseen issues the date of the next public running day at Ingfield Light Railway has been moved from Sunday the 15th of May to Sunday the 22nd May. Sorry for any inconvenience. More details to follow.